Over the past few decades, towns and cities have increasingly come to recognize the problems with conventional zoning. Many began using planned unit developments, clustering, or similar tools that do an end-run around conventional zoning, allowing mixed-use compact development and preserving open space. However, most of these PUD ordinances still rely on conventional zoning techniques as the regulating mechanisms and, because they represent a giant loophole to enable a developer to avoid the existing zoning, the nature of the resulting development is unpredictable. PUDs are generally not based on a detailed community vision for a specific place and seldom produce new development that is integrated with the adjacent community. PUDs are generally not based on a detailed community vision for a specific place and seldom produce new development that is integrated with the adjacent community. Rather, they are based on the financial goals of a developer in a specific real estate market, and frequently result in large-scale, stand-alone, “pods” of development. To the extent that they mix different uses, it is usually in separate areas that are not walkable and that exacerbate traffic problems. The prevalence of PUDs and other forms of negotiated development is a sure sign that an existing zoning ordinance is completely broken and vulnerable to political deal making. It is little wonder that these developments are widely opposed by surrounding neighborhoods. The earliest modern form-based codes were developed by adapting the PUD process (despite its inherent flaws), because it was the only zoning tool available that offered sufficient flexibility. Innovative developers wanted to build new walkable, "traditional neighborhoods" with smaller lots, a range of housing types, narrower streets, and mixed-use centers. They found that they were not allowed to do this under the existing zoning and subdivision regulations so they had to use the PUD process to escape the confines of the existing zoning. This enabled them to design a development based on a holistic vision of a place (with more detail and specific parameters for form and character than the PUD process normally required). This creative adaptation of the PUD tool focused on the placement, scale, and form of the buildings; the street network; the creation of public spaces; and mixing of uses in a more coherent and walkable setting. The PUD process allowed these visionary developers to experiment with forms of development that were not allowed under existing zoning, leading to the invention of the modern form-based code. Cities began recognizing the potential usefulness of form-based codes for regulating infill and redevelopment for historic town centers and revitalization districts [where] existing zoning codes ... made redevelopment an arduous process, with disappointing results. 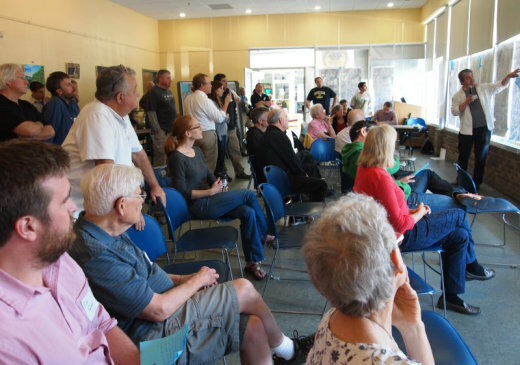 Following on the heels of these “traditional neighborhood” form-based codes written for PUDs (usually in undeveloped "greenfield" locations), cities began recognizing the potential usefulness of form-based codes for regulating infill and redevelopment for historic town centers and revitalization districts. In these locations -- where the preservation and enhancement of the existing urban fabric was important -- existing zoning codes, with their typically suburban-oriented standards for setbacks and on-site parking, made redevelopment an arduous process, with disappointing results. Other cities began using FBCs to direct the transformation of aging auto-oriented corridors -- where the public realm had been non-existent or dominated by large-scale thoroughfares with surface parking lots at the front and buildings placed at the rear of the lots. Communities developed corridor master plans that completely re-envisioned the character, scale, and orientation of the corridor, with the goal of creating mixed-use, walkable centers and neighborhoods. The use of form-based codes is continuing to expand. A few cities and towns have replaced entire zoning ordinances, but more commonly, FBCs are used in more limited areas. In addition to the downtowns and corridors described above, FBCs have been used to implement transit-oriented development, transform dead malls (or grayfields) into new pedestrian-friendly, mixed-use neighborhoods, and create new walkable, mixed-use communities. Public participation is key to development of an effective form-based code. Charrettes are often used as part of this process. More on public participation and charrettes in Part 4 of our article. Photo courtesy of Ferrell Madden. Whether or not a form-based code requires high density and/or mixed use depends upon the community vision plan that it implements. Generally, form-based codes have higher density in a downtown core area, where there is also mixed use. This gives a community the critical mass needed to support commerce as well as a true “center” and sense of place. FBCs can also specify lower-density areas outside of the core, with less mixing of uses. However, many desirable uses that are not usually permitted in conventional zoning codes, such as traditional neighborhood corner stores with upstairs apartments, are specifically permitted in form-based codes if they are part of the community’s vision. Such non-residential or mixed uses must satisfy building form and placement criteria so that they fit into the fabric of the neighborhood. By requiring buildings to be multi-story and adjoin the sidewalk, these codes do not permit typical single-story franchise convenience stores with big parking lots in front. Both are retail uses, but the traditional pedestrian-oriented neighborhood corner store has a very different form than the car-oriented convenience store franchise. The concepts of “urban form” and “the public realm,” central to form-based codes, are absent from the conventional zoning vocabulary. While architecture is about the design of individual buildings, urban form is about the physical design of cities and town -- how the pieces fit together. It's also definitely more than just cosmetic improvements such as brick sidewalks and period light poles with banners. Urban form can exist at any scale, from a tiny hamlet to a major urban center. It is not necessarily about cities, but rather about shaping a place that is comfortable, inviting, and walkable. The public realm is an integral component of urban form. It is more than just parks, squares, greens, and plazas -- though those are important. The public realm is generally described as the entire space between one building façade and another across the street. It includes streets, sidewalks, and on-street parking, as well as the verge (also referred to in various parts of the country by terms such as tree lawns, tree belts, sidewalk buffers, and parking strips). The public realm also includes privately owned land that contributes to the visual environment of the streetscape. In mixed-use downtown areas this may include the land between a building's front facade and the sidewalk. In more residential areas, it may include entire front yards. The fact that private land that borders a public sidewalk is considered to be part of the public realm does not make it public space. Rather, it is private space that is visually accessible to the public and therefore shapes how we experience the streetscape as a whole. How tall are the buildings and how close are they to the sidewalk? How wide are the sidewalks? Do the building facades have doors and windows along the sidewalk? How many lanes of traffic are there and how wide are they? Is there an interconnected network of streets and blocks? Are the blocks short or long? Are there alleys and courtyards? What about special public spaces, such as greens, squares and plazas? Is it just as easy to walk around the area as to drive? Does it feel safe to walk or are the cars going too fast? These are all aspects of urban form that directly affect the public realm. The uses within the buildings help to further define the character of the public realm -- if they are retail, the sidewalks will be more active during business hours; if they are residential, the street may be quieter during the day and lively at night and on the weekends. If they are mixed-use, with one activity below and a different one on the upper stories, streets will be more actively used at different times of the day. Both conventional zoning and form-based codes regulate use, but in very different ways. However, since form-based codes are all about community character and how buildings shape the spaces around them, the uses that occur within buildings are not as important as the relationships of buildings and their facades to the public streetscape. Still, some uses clearly fit with a given type of community character better than others, so a form-based code will regulate use -- but with a much simpler kind of use table than is found in most zoning codes. A major purpose of conventional zoning codes has always been the separation of uses from one another. Form-based codes mix uses that work together synergistically, such as retail shops and upper floor apartments or offices. The goal of creating walkable centers necessitates mixing of uses. It is important to recognize that form-based codes still aim to prevent the juxtaposition of inherently incompatible uses, such as large factories and single-family homes. For an example of a use table that is part of a form-based code, see our next post. Form-based codes are written with the creation (or preservation) of a specific urban form in mind -- to regulate private development so that it consciously shapes the public realm. The most beautiful building in the world is wasted if it sits on a busy thoroughfare, behind acres of parking, with multiple lanes of high-speed traffic, limited or no sidewalks, and no street trees. 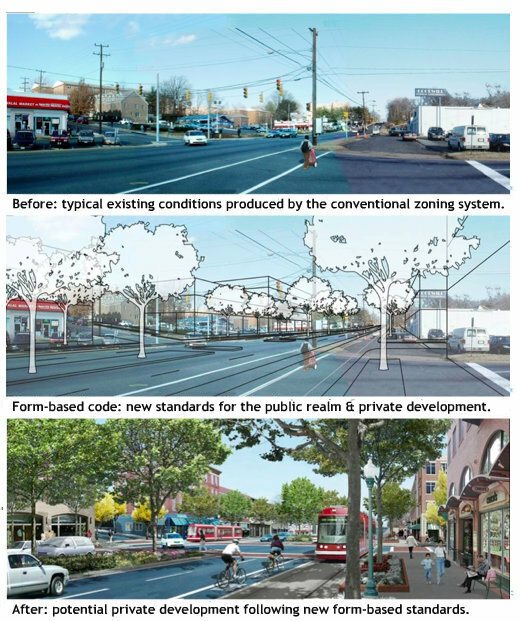 To this end, FBCs integrate subdivision and zoning regulations (where state law allows), sidewalk and street standards, and rules for parks and other public spaces -- recognizing that public streets and sidewalks and private development work together to define the public realm and create vibrant, livable places. Without a vital public realm, there is truly no “there” there. In addition to their emphasis on form over use, how else do form-based codes differ from conventional zoning? ⇒ A well-written form-based code uses plain English, easy to understand for layman and professional alike. ⇒ FBCs are highly graphic, with diagrams and images to both regulate and illustrate intent. Diagrams and pictures are often a more concise and understandable way to regulate form. ⇒ FBCs start with a vision and plan for a place, not from arbitrary numerical parameters typically found in a conventional zoning code. Conventional zoning standards are not based upon the desired physical character of a specific place. They apply in a broad-brush manner throughout a zoning district, even if the physical characteristics of parts of the zoning district are entirely different from one another. ⇒ FBCs use clear, objective standards wherever possible that are based on a place-based physical plan prepared through a public process. The FBC consists of detailed regulations that implement a specific vision for the form and character of future development. ⇒ FBCs streamline the administrative review and approval processes. If the objective standards laid out in the plan and code are satisfied, most development is allowed by right, increasing certainty for neighbors and developers alike. ⇒ FBCs are fairly prescriptive for those issues that fundamentally affect the public realm -- such as building height and placement on the lot, and windows and doors on the street -- and more flexible on issues such as land uses (often using broad ranges rather than exhaustive lists of possible uses). ⇒ FBCs assume that building uses will change over time -- if the physical form is appropriate for the location, such changes should require minimal review or regulation. In Part 3, a look at the typical elements found in a form-based code.